Frugality is a deeply-thought philosophy of life, not just “a thing of the past”. 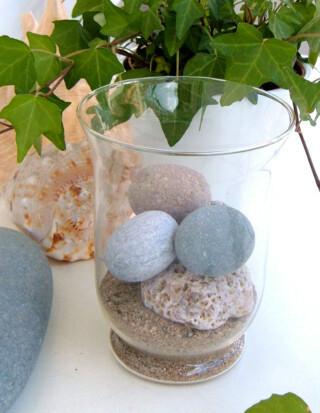 In this section, you will get valuable ideas and tips on how to be frugal with beach stones and have fun. Small art and crafts business owners, as well as teachers, will also benefit from the information in this section, as being frugal with beach stones grows a solution-oriented-mindset, cultivates creative thinking, which is much needed in business and education. At almost no cost, using beach pebbles and other beach finds, you can create beautiful handmade gifts to show your gratitude to people who have made a difference in your life. You can also craft art and various decoration items for your own home, not to mention the artful and stylish accessories you can make for yourself (e.g. pebble jewelry, hair accessories, tote and purse embellishments). Think of the memories and emotions that go along with a personalized gift you’ve handcrafted, for someone you care about, with one or two uniquely shaped pebbles, or a semi-precious beach rock, they brought back from their vacations. You cannot buy those memories, and the feelings from the experience they’ve had, for all the money in the world! “I don’t make enough money and I work all day. When I get home I’m exhausted; I’m neither in the mood, nor have time for hobbies.” some of you may say. That’s exactly the point – you don’t make enough money and you also need to save money. But even if you earn a good income why not be able to save more or invest more or donate some of your money to support a cause you believe in? The information given here will help you cope with part of your financial difficulties, in an earth-friendly way. You will discover new interests and passions, you will learn new skills. Of course, you could use this information to develop a new hobby, but it doesn’t have to be so. You could, instead, only use this knowledge for practical purposes, that is to save money by adopting a green signature fashion-and-décor style of your own. Being frugal with beach stones sets you free from the bad habit of spending money on things you don’t actually need, or on things you can do and make yourself. You will become self-reliant and self-confident, knowing that you can fulfill lots of your desires even if you don’t have a lot of money. For example, you can create, all by yourself (and perhaps with a little help from a friend or family member), a beautiful and unique, earth-friendly garden or backyard landscape design - you can craft garden and yard decorations with beach rocks and pebbles, some of them cute and others amazing. You neither have to pay large amounts of money to landscaping companies, especially if your garden space is small, nor have to buy expensive outside décor items to create pleasant and memorable outdoor environments. Being frugal with beach stones is also about learning to entertain yourself, your friends and your family through the appreciation of nature’s abundance, part of which are beach stone treasures - it is an appreciation which will help you lead a healthier and more balanced life outdoors and indoors too. This section of my website is your place for free, fun beach stone activities, creative pebble art and rock crafts, minimal and zen inspired. There’s too much of industrialization in our everyday life – we need to make room in our homes, our social relationships and our hearts to bring in nature, natural materials (like beach pebbles and beach rocks), natural ways and procedures in producing our goods. Being frugal with beach stones does not mean you cut luxury out of your life. Nor does it mean you don’t buy things you need. It means you are open-minded and clever enough to redefine both luxury and necessity. Click on the following links – you will find lists of things you can make and do with beach stones to live a frugal life with less stress.